A 5-Star rating can be biased at times, but let me leave you with this. 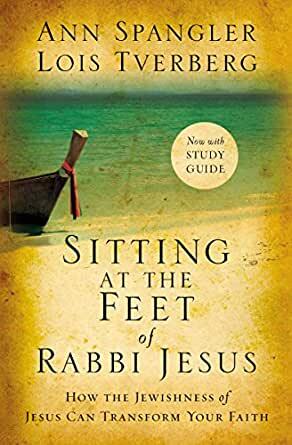 I choose to rate “Sitting at the Feet of Rabbi Jesus” with five stars because it showed me the fabric of Jesus as a Jewish Rabbi like my first pair of glasses showed me the vibrant colors of the trees, sky and other objects around me like I had not seen them before. When I was around twelve years of age I needed corrective lenses. That meant I was going to get a pair of prescription eye glasses for the first time. They were big, unflattering and upon putting them on for the first time, my perception of gravity, that is, the experience of how my feet hit the pavement as I walked greatly changed and colors became for the first time robust right before my eyes! Reading “Sitting at the Feet of Rabbi Jesus” for those who are not Jewish such as myself, was like my depth perception being drastically changed when those eye glasses went on. Yet, like those robust colors that came to life, so it is, to know Jesus as a Jewish Rabbi. I recommend this book to Jews and Gentiles (non-Jewish people) alike. The vivid tapestry of His Jewishness is quite captivating and the Jewish culture and people who He was intimately acquainted with and surrounded by will both challenge and intrigue you. Like most books on the subject of God or Jesus of Nazareth, one reading will never suffice. The first reading is both engrossing and a bit of a struggle. Every other reading, will produce more and more affect to a desired conclusion—to know this Jewish Rabbi that still intrigues and confounds the world 2000 years later. Wow! This book is amazing! I have read this book several times and learn something new each time. This a great introduction book to someone interested in learning how the Old Testament and New Testament connect. Also, this book motivates/encourages me to read the Bible more frequently. Each page you learn something new, and I could not recommend it more! If you are having a difficult time getting excited about the Old Testament, get this book! It brings life and understanding to time Jesus was living. If you are on the edge, buy it. Best Christian resource book I have ever bought! 5.0 out of 5 starsHighly Recommend, as an anthropologist! This book changed my perspective on a lot of things. I am an anthropologist and I know the importance culture plays in the perspectives and actions of people. But, if you don't understand a culture, you aren't going to understand the person...you will just be frustrated and confused and eventually settle on 'never understanding' them. But when you get a glimpse of the 'why' by exploring aspects of their native culture, light bulbs begin to illuminate your perspectives. This book does this very thing, but with the person and culture of Jesus the Messiah! Amazing! I would recommend this book to anyone, Christian or non-Christian. It has powerful and profound insights to many stunning realities of Jesus' actions and the correlations to ancient and modern Jewish culture. Read this! You'll benefit from it, I promise! Well presented in a fashion that is accessible to ordinary readers. You do not need to be an academic to engage with the material. The writers of this book present fascinating insights into Jewish culture and language of Jesus time, and even middle Eastern culture that persists to this day - all of which informs our reading of the New Testament. Reading and interpreting the Bible from and Western, Industrialized, Educated, Rich and Democratic mindset will always bring questions that cannot be answered, and interpretations that are not really what Jesus meant. I highly recommend this book, and other books by Lois Tverberg. I learned so much reading this book and it's follow up Walking in the dust of Rabbi Jesus which I unknowingly read first. I highly recommend reading both! I'm currently on a journey learning the true Hebrew meaning behind the Scriptures and these two books will give you greater and more in depth understanding of Jewish life and customs. Now I wanna go back and read Jesus words with the more Hebrew understanding I have learned.